Have you ever noticed that adults basically sing when they communicate with infants? Think about it. How do we say "peek-a-boo" or "good girl" or "eat your peas" when talking to a young child? We literally raise and lower our voices into exaggerated songs. And why do we do this? Because we want to make a connection -- we want to "move" the infant with our voices in order to communicate something that transcends the words being used. We do this instinctively. Music is almost like "touch," but at a distance. When we sing the words "that's a good boy" to a 4 year old, we're trying to convey the equivalent of a hug or a pat on the back. The words alone can't accomplish that, so we add music. The power of music to communicate on a visceral level is an extremely useful tool in education. It makes messages more profound and memorable. Thats why kids' music classes should not just be about music. Instead, music should be used as a vehicle for delivering information. We took this idea to heart when we created our Music PlayHouse program for 4 & 5 year olds. Each month we focus on 4 themes: rhythm, melody, harmony and vocabulary. But each theme is treated as a means to and end. For example, when we focus on rhythm, our main objective is not to teach the children to move to the beat like Michael Jackson (although that would be extremely cool). We're using rhythm to get at something deeper. Our main objective is to use rhythm to improve perception, attention, working memory, learning and language. In the words of Carnegie Mellon neuroscientist Nathan Urban, "The brain absolutely has rhythm." So if you're considering getting your kids music lessons, take a moment to ponder the larger goal -- particularly if your kids are age 5 or younger. Do you want your child to learn how to "keep the beat," or do you do you want to expand your child's capacity for complex pattern recognition in order improve his ability to learn from and interact with the world? Music is a vehicle for profound connection and growth. Consciously, or unconsciously, you know this. Every time you slip into that sing-song voice (you know the one I'm talking about) while communicating with a child you're using music as a means not an end. Good work! 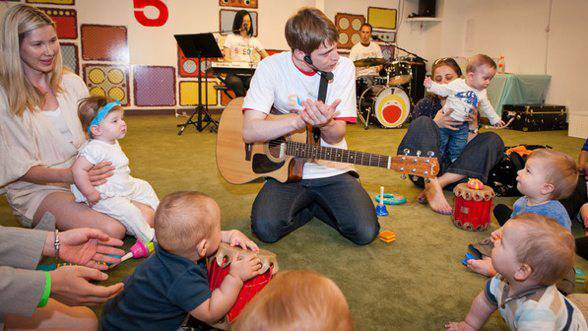 Click here to learn more about our early childhood music program, Music PlayHouse.